1 tree planted in memory of James W. Welch, Jr. Celebrating the life of James W. Welch, Jr.
Obituary for James W. Welch, Jr.
James White Welch, Jr. passed away peacefully and comfortably the morning of February 10, 2019 at the age of 70 years old. He was born in Kingstree, South Carolina on March 5, 1948 to James (Tony) White Welch, Sr. and Mary Emma Welch (Gilleland). Jim spent four years in the U.S. Marine Corps proudly serving his country. Those years were something he always held near and dear to his heart. He was stationed in Japan during the end of the Vietnam War as a reconnaissance photographer. Jim owned his own business for many years, he was a glass etcher and took great pride in his work. Jim was a caring husband, father, brother, uncle and friend. 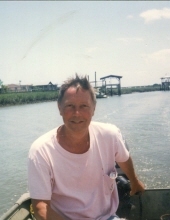 During his spare time, Jim loved to golf, salt water fish and cast shrimp nets into his beloved creek at Pawleys Island, South Carolina. He is survived by his wife of 28 years, Carolyn Welch and three children; one son from his first marriage, James Welch; one son from Carolyn's first marriage, Frank Como; and one daughter from Jim and Carolyn's marriage, Christina Welch. Jim is also survived by his siblings Ted Welch, Bill Welch and Ann Brown (Welch). Two memorials will be held to commemorate the life of Jim. One will be held on April 27, 2019 in Toledo, Ohio and the other on September 15th, 2019 in Pawleys Island, South Carolina. Please contact Carolyn Welch or Christina Welch for more information. To plant a tree in memory of James W. Welch, Jr., please visit our Tribute Store. "Email Address" would like to share the life celebration of James W. Welch, Jr.. Click on the "link" to go to share a favorite memory or leave a condolence message for the family.